February 7, 2011 – The New Mexico Public Regulation Commission's (PRC) Division of Insurance (DoI), in conjunction with the Rocky Mountain Insurance Information Association (RMIIA), is taking steps to assist New Mexico residents in their efforts to file insurance claims in the wake of last week's devastating winter storm. Sub-zero temperatures wreaked havoc on residential water pipes, leading to countless thousands of dollars in water damage at residences from Northern New Mexico to the south central portion of the state, prompting homeowners and renters to file claims with their insurance companies. DoI and RMIIA are aware of the challenges that arise in the wake of such storms and stand ready to assist New Mexicans in any way they can. "If you have water damage from frozen pipes, contact your insurance agent or insurance company as early as possible," New Mexico Superintendent of Insurance John Franchini said. "If you need further assistance, contact our claims expert, John Gaherty, at 505-827-4601 or via e-mail at john.gaherty@state.nm.us." RMIIA representatives note that even a small amount of water can lead to thousands of dollars in damage. "Even a small amount of water can cause serious damage to your home," RMIIA Executive Director Carole Walker said. "The average water damage claim is $5,500, but can easily cost tens of thousands of dollars with a broken pipe spewing gallons of water onto floors, furniture and personal property." Most standard homeowners' policies will cover most of the kinds of damage that results from a freeze. Affected homeowners and renters are encouraged to save receipts for any freeze-related expenses so that those costs can be reimbursed under a claim settlement. Filing a claim is a fairly easy process. Those who've encountered weather related water damage should be prepared to provide their respective insurance agent or representative a description of any adamage. 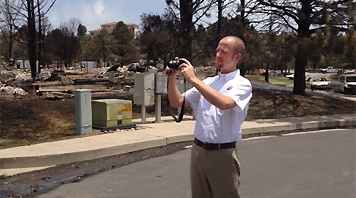 Agents will report losses immediately to insurance companies or qualified adjusters. Additional advice for those filing claims include: taking photos of damaged areas (these help with claims processing and assist adjusters with their investigations; prepare a detailed inventory of all damaged or destroyed personal property (a copy of the inventory should be given to the adjuster while a second copy should be kept by the affected party); make temporary repairs to prevent further damage (save receipts); and secure a detailed estimate for permanent repairs (estimates should contain the proposed repairs, repair costs and replacement prices. Serious losses will be given priority. If your home has been destroyed or seriously damaged, your agent will do everything possible to assure that you're given priority. As additional cold weather is expected in the coming weeks, homeowners and renters can take a few precautionary steps to avoid frozen pipes: keep your home warm (at least 65 degrees to prevent pipes from freezing); keep cupboard doors open blow sinks (this allows warm air to circulate around indoor pipes); turn on hot and cold faucets enough to allow a slow drip; keep garage doors closed; know the location of the main water shut off valve in your home (a damaged hose or a burst pipe can send water racing into a home); install an emergency pressure release valve in your plumbing system (this protects against the increased pressure caused by freezing pipes and can help prevent your pipes from bursting); and check pipes regularly (look closely for cracks and leaks and have affected pipes repaired immediately. Additional information for consumers on insurance topics can be obtained at www.nmprc.state.nm.us/id.htm or www.rmiia.org. Phone inquiries should be made to the New Mexico PRC's Division of Insurance at 505-827-4601 or to the Rocky Mountain Insurance Information Association at 303-790-0216.